Cultural Studies have been preoccupied with questions of national identity and cultural representations. At the same time, feminist studies have insisted upon the entanglement of gender with issues of nation, class, and ethnicity. 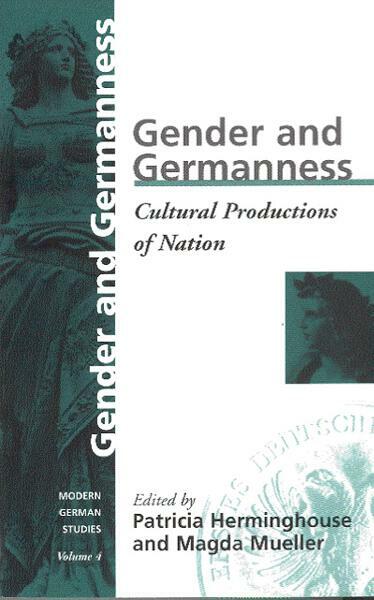 Developments in the wake of German unification demand a reassessment of the nexus of gender, Germanness and nationhood. The contributors to this volume pursue these strands of the cultural debate in German history, literature, visual arts, and language over a period of three hundred years in sections devoted to History and the Canon, Visual Culture, Germany and Her "Others," and Language and Power. Contributors: L. Adelson, A. Taylor Allen, K. Bauer, R. Berman, B. Byg, M. Denman, E. Frederiksen, S. Friedrichsmeyer, E. Kaufmann, L. Koepnick, B. Kosta, S. Lefko, A. M.O'Sickey, B. Mennel, H. M. Müller, B. Peterson, L. Pusch, D. Sweet, H. Watt, S. Zantop. Patricia Herminghouse teaches in the Department of Modern Languages and Culture at the University of Rochester. Magda Mueller in the Department of Foreign Languages and Literatures at California State University, Chico. Chapter 21. Language is Publicity for Men – but enough is enough! Chapter 22. The New Duden: Out of Date Already?